These are lyrics by The Sugarcubes that we think are kind of repetitive. Ok, they do this at the begining of the song, then a lot through the song, then, when they aren't repeating cat over and over, it's all Icelandic. Don't get me wrong, it's a funny funny hahaha song. Why don't you shoot him? 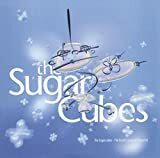 I adore the Sugarcubes, but it sure takes a long time (about thirty repetitions) for Bj�rk to convince Einar to shoot him.